Something special happened in County Tipperary last Saturday. At the ICT in Education Conference at LIT Thurles, Pamela O’Brien and the conference organisers stretched the boundaries of the usual conference format. The conference theme of “Student Voices” was embraced, with young voices to the fore. As described by Pam Moran in her conference reflection: at #ICTEdu “adults didn’t talk about children in their absence, but rather listened to children in their presence.” The result was powerful learning, a new appreciation for what’s possible, and big plans (already) for embracing this model even further. In my previous post I described some of the unique aspects of the #ICTEdu conference. The conference attracts educators from across all education sectors, from within Ireland and beyond. Educators meet to discuss, to share resources, and to share ideas about learning and teaching. As has been the case in recent years, an excellent programme of workshops and keynotes was organised. The heart of the conference, however, was the group of young people who participated in the conference as the Youth Media Team: speaking, interviewing, photographing, tweeting and blogging. The Youth Media Team (easily spotted in their red shirts) was mentored by another great team: Bernie Goldbach, Conor Galvin and Joe Dale. The mentors listened, answered questions and advised, but mostly encouraged each member of the Youth Media Team to engage with people at the conference, and beyond, and to create their own media and narrative of the day. The young people did just that; engaging with and interviewing conference participants — including Junior Minister for Education and Skills Ciaran Cannon — recording their observations and reflections, and speaking about their experiences at the end of the conference. The #ICTEdu conference model is a great start. 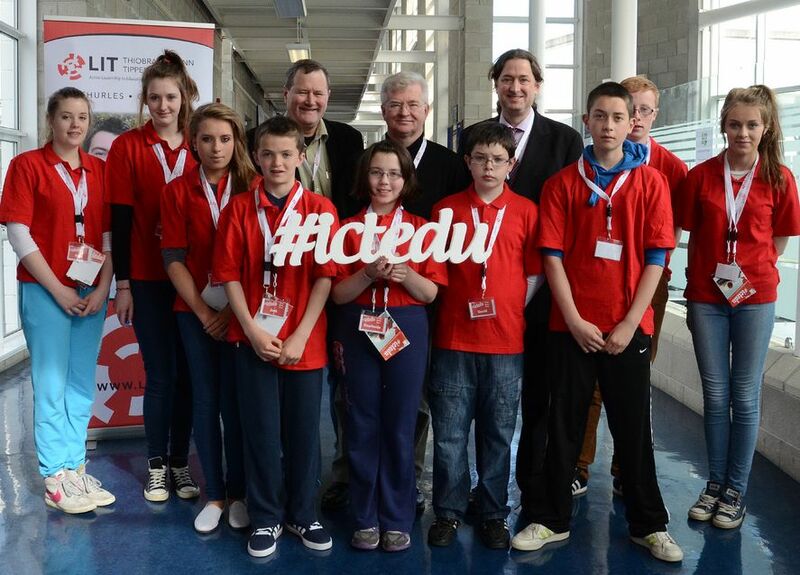 It must be acknowledged that student voices were present at the #ICTEdu conference in many other ways as well. The educators presenting and sharing their work at #ICTEdu — and at the lively #CESImeet the previous evening — are doing some of the most innovative and exciting work I know of: creating learning spaces for young people to connect, code and create in classrooms and community settings, as well as online. It would be impossible to summarise all of the workshops, but the following is a taster. Please visit the conference blog and audio interviews recorded by the Youth Media Team for ideas shared by other educators at the conference. Mary Jo Bell, a Senior Infants teacher in Dublin, has been using Twitter with her class @MrsBellsClass for over two years. She also uses Animoto, Voki, eportfolios, Skype and Google+. Mary Jo’s Slideshare Technology in the Infant Classroom, well worth sharing, describes how her school’s youngest students are leading the way. Maire O’Keeffe, a 5th class teacher in Kinvara, began using digital and social media with her students at the start of this school year. Since September, students have written hundreds of posts on Ms. O’Keeffe’s class blog and had over 138,000 views. Through their blog, class Twitter account (@msokeeffesclass) and Skype, the children connect with other students and teachers around the world. Maire spoke about the power of the 100 Word Challenge in kickstarting her students’ blogging; she encourages more schools to try it. Joe Dale, education and technology consultant in the UK, contributed to the conference in multiple ways. As well as mentoring the Youth Media Team along with Bernie and Conor, Joe shared classroom management apps and a terrific range of audio tools for education at both the #CESImeet and the conference. Grainne Conole, a keynote speaker at the conference, tried out Audioboo after Joe’s workshop and recorded this short interview with Joe, in which he describes some great audio apps for educators (see also joedale.typepad.com). Bernie Goldbach, innovative Multimedia lecturer at LIT Thurles, facilitated a workshop also focusing on audio in which he used Audioboo within a live Google+ hangout — a wonderful demonstration of live, global collaboration and learning. Each of the three keynote speakers, Grainne Conole, Martha Rotter and myself, explored student voices in the context of learning. I will summarise these in my next blog post. And don’t miss the conference doodles by Rachael Cooke, a recent Creative Multimedia graduate from LIT — she added a whole new dimension to the conference with her creative artwork! Finally, my thanks again to the students: the nine members of the Youth Media Team and the many, many students who voices and ideas were shared by their teachers during the workshops and presentations. The message from students was loud and clear: more freedom, more choice, more fun, more practical work, more opportunities for connecting and interacting. The message from educators at #ICTEdu was also clear: we are listening. We must move forward together. Photos by ictedulit All Rights Reserved, used here with permission. It is great to see young people involved in education conferences, their voices are very important and often ignored in education development/initiatives. When I read the examples of how teachers integrate ICTs in their classroom all I can think about is 1) how Awesome, authentic & fun it must be and 2) how disadvantaged our schools are in Qld Australia. We have the tools to do all those things; however, they’re mostly all BLOCKED! Thanks, Elke. It was inspiring to see — and feel the energy of! — the young people involved in the conference. We certainly could do much more of this. Many of our teachers who are using technology and social media in their classrooms have had to work within their schools to raise awareness about enabling access to the Internet. Do you have any fellow teachers in your district who could work with you to do this? At the very least, you could use some of the examples of the teachers & students described here (and there are many others!) to help raise awareness about how powerful — and necessary — this kind of authentic, connected learning can be. I wish you the best of luck.